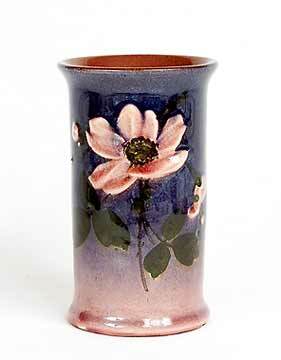 Cylindrical Watcombe vase - 4½" (114 mm) high. Watcombe Pottery, originally known as The Watcombe Terra-Cotta Clay Company, was started by G J Allen in 1871 to use the red clay found around the area of Torquay in Devon. The company very quickly established a reputation and its wares were exhibited internationally within a few years. The pottery expanded rapidly, employing a vast work force by the end of the decade. The company was bought by Evans & Co in 1884 after the death of Allen, and in 1901 was acquired by Hexter, Humpherson & Co, who amalgamated it with Aller Vale Pottery. The new pottery was known as Royal Aller Vale & Watcombe Co.